Home prices hit new post-crisis lows in March. 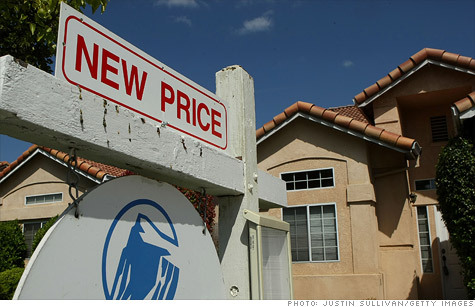 NEW YORK (CNNMoney) -- Home prices hit new post-bubble lows in March, according to a report out Tuesday. Average home prices were down 2.6% from 12 months earlier, according to the S&P/Case-Shiller home price index of 20 major markets. Home prices have not been this low since mid-2002. "While there has been improvement in some regions, housing prices have not turned," said David Blitzer, spokesman for S&P. Although five cities -- Atlanta, Chicago, Las Vegas, New York and Portland -- saw average home prices hit new lows, that's an improvement from last month's report, in which nine cities notched new lows, Blitzer noted. In 13 of the 20 cities, average home prices fell in March from the year before. Atlanta fared the worst, with home prices down 17.7% year over year. Home prices in Atlanta, Cleveland, Detroit and Las Vegas are all below their January 2000 levels. Alternatively, Phoenix posted the largest gain, with prices up 6.1% from last year. Other cities showing an uptick included Dallas, Denver and Miami. Overall, the 20-city composite is down about 35% from its peak in 2006. Experts say affordable mortgages, combined with much lower home prices, should help to bolster the housing market. "It's probably the best time to buy a home in decades," said Pat Newport, an analyst for IHS Global Insight. "But the problem is that unless you have good credit, you are probably going to have trouble qualifying for a loan," he added, referring to overly tight lending conditions. Last week, a report by the National Association of Realtors showed that home sales jumped in April. Sales of new homes were also higher in April, according to a separate government report. "This might be a strong season, but there's a good chance we'll continue down for years still," said Robert Shiller, professor of economics at Yale University. "There's too much uncertainty." Correction: An earlier version of this story misquoted Robert Shiller as saying that home prices would continue down for a year, instead of years. That quote has been fixed.